The made-for-aviation invention by company founder/product inventor Tom Burden has come to market over the past two years. Burden used to maintain aircraft for the 180th Fighter Wing of the Ohio Air National Guard and needed something to keep his tools from sliding away from him while working on the machines. 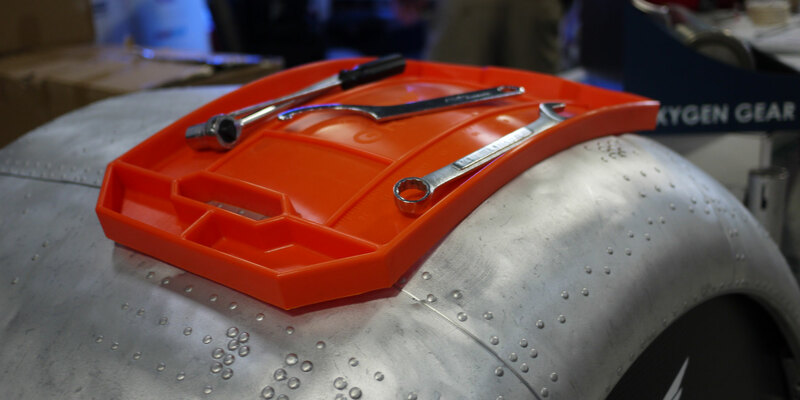 The flexible, tacky material that forms the Grypmat tool caddy holds both the tools and fasteners placed within it, preventing them from rolling around, and holds fast to any surface, including an engine cowling or cambered wing. The separate bins within the Grypmat keep mechanics organized and aid in tool inventory. Grypmats come in three sizes, ranging in cost from $29.99 to $69.99, and can be purchased from both Aircraft Spruce and Amazon, as well as at the Sun ’n‘ Fun show this week (Booth 062, Hangar A). Grypmat is an Ideadvance and Aeroinnovate alumnus. The mentorship, capital, and guidance provided by both groups helped accelerate the Grypmat from a Kickstarter prototype to a globally distributed product. The company’s primary logistics and fulfillment facility is in Kohler, Wisconsin, and its military development office is located in Milwaukee.